Tooth implants are a technologically advanced form of dental surgery that can benefit patients who are missing just one or all of their teeth. 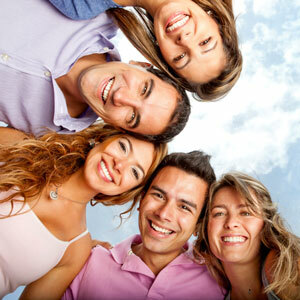 They are the most natural-looking tooth replacement option and can improve the form and function of your smile. Teeth implants involve inserting fine titanium screws into either the upper or lower jaw, which act very much like the root of a tooth. These are used to hold a dental crown firmly in place as a long-term solution to missing Teeth. 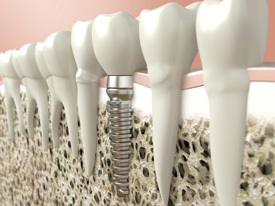 Over time your jawbone will fuse with the tooth Implant just as it would with a natural tooth root. Dental Bridges. Bridges can be fitted onto the implant and can help to cover gaps due to missing or damaged teeth. Dentures. Customised dentures can be made that will fit onto the existing Implants. Dental Crowns. A tooth crown can help to cover the gap left by a single missing tooth, held firmly in place by an implant. Some dentists are trained to do implant surgery themselves but as part of our commitment to our patients, we recommend the procedure is done by our dedicated Oral Surgeon. Our Oral Surgeon is committed to providing a top-class service for our patients; and, in complex cases, will provide patients with his own mobile number just in case they have any problems or concerns. To find out more about dental implants Melbourne, contact us and simply book a free 15 minute consultation – (03) 9827 2922.